What would God do with a high priest who would not discipline his unruly sons? God had said of Abraham, "I know him, that he will command his children and his household after him, and they shall keep the way of the Lord, to do justice and judgment." Genesis 18:19. But Eli allowed his children to control him. The father became subject to the children. The curse of transgression was apparent in the corruption and evil that marked the course of his sons. They had no proper appreciation of the character of God or of the sacredness of His law. His service was to them a common thing. From childhood they had been accustomed to the sanctuary and its service; but instead of becoming more reverent, [p. 576] they had lost all sense of its holiness and significance. 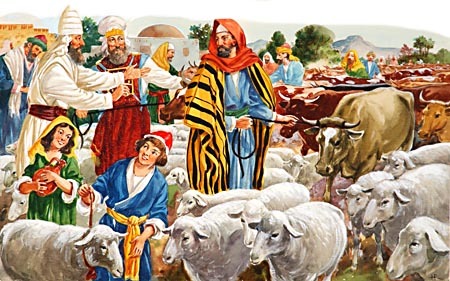 The father had not corrected their want of reverence for his authority, had not checked their disrespect for the solemn services of the sanctuary; and when they reached manhood, they were full of the deadly fruits of skepticism and rebellion. These unfaithful priests also transgressed God's law and dishonored their sacred office by their vile and degrading practices; [p. 577] yet they continued to pollute by their presence the tabernacle of God. Many of the people, filled with indignation at the corrupt course of Hophni and Phinehas, ceased to come up to the appointed place of worship. Thus the service which God had ordained was despised and neglected because associated with the sins of wicked men, while those whose hearts were inclined to evil were emboldened in sin. Ungodliness, profligacy, and even idolatry prevailed to a fearful extent. "There came a man of God unto Eli, and said unto him, Thus saith the Lord, Did I plainly appear unto the house of thy father, when they were in Egypt in Pharaoh's house? And did I choose him out of all the tribes of Israel to be My priest, to offer upon Mine altar, to burn incense, to wear an ephod before Me? and did I give unto the house of thy father all the offerings made by fire of the children of Israel? Wherefore kick ye at My sacrifice and at Mine offering, which I have commanded in My habitation; and honorest thy sons above Me, to make yourselves fat with the chiefest of all the offerings of Israel My people? Wherefore the Lord God of Israel saith, I said indeed that thy house, and the house of thy father, should walk before Me forever: but now the Lord saith, Be it far from Me; for them that [p. 578] honor Me I will honor, and they that despise Me shall be lightly esteemed. . . . And I will raise Me up a faithful priest, that shall do according to that which is in Mine heart and in My mind: and I will build him a sure house; and he shall walk before Mine anointed forever." Eli did not manage his household according to God's rules for family government. He followed his own judgment. The fond father overlooked the faults and sins of his sons in their childhood, flattering himself that after a time they would outgrow their evil tendencies. Many are now making a similar mistake. They think they know a better way of training their children than that which God has given in His word. They foster wrong tendencies in them, urging as an excuse, "They are too young to be punished. Wait till they become older, and can be reasoned with." Thus wrong habits are left to strengthen until they become [p. 579] second nature. The children grow up without restraint, with traits of character that are a lifelong curse to them and are liable to be reproduced in others. The promise had been made that the house of Aaron should walk before God forever; but this promise had been made on condition that they should devote themselves to the work of the sanctuary with singleness of heart and honor God in all their ways, not serving self nor following their own perverse inclinations. Eli and his sons had been tested, and the Lord had found them wholly unworthy of the exalted position of priests in His service. And God declared, "Be it far from Me." He could not [p. 580] accomplish the good that He had meant to do them, because they failed to do their part. In Eli's reproof to his sons are words of solemn and fearful import—words that all who minister in sacred things would do well to ponder: "If one man sin against another, the judge shall judge him: but if a man sin against the Lord, who shall entreat for him.?" Had their crimes injured only their fellow men, the judge might have made reconciliation by appointing a penalty and requiring restitution; and thus the offenders might have been pardoned. Or had they not been guilty of a presumptuous sin, a sin offering might have been presented for them. But their sins were so interwoven with their ministration as priests of the Most High, in offering sacrifice for sin, the work of God was so profaned and dishonored before the people, that no expiation could be accepted for them. Their own father, though himself high priest, dared not make intercession in their behalf; he could not shield them from the wrath of a holy God. Of all sinners, those are most guilty who cast contempt upon the means that Heaven has provided for man's redemption—who "crucify to themselves the Son of God afresh, and put Him to an open shame." Hebrews 6:6. Click here to read the next chapter: "The Ark Taken by the Philistines"